We’ve been traveling in SE Asia since January, and with a few exceptions (most notably the first part of our trip in Myanmar), we have been hot. Now, I don’t mean hot the way our hometown of Denver is hot. It can get pretty high on the temperature scale, but thankfully, home doesn’t deliver on the humidity. Since we hit Singapore back in late January, we have been dealing with off the charts heat and humidity. We went through what was locally described as unseasonably hot weather in Luang Prabang, Chiang Mai, and in the middle parts of Vietnam. We had even planned our trip throughout the region with heat in mind. We purposefully left Vietnam for our last stop because we knew that central and northern Vietnam would be cooler. When we hit Hoi An and Hue and we were still sweating through our shirts, we were a bit disappointed. 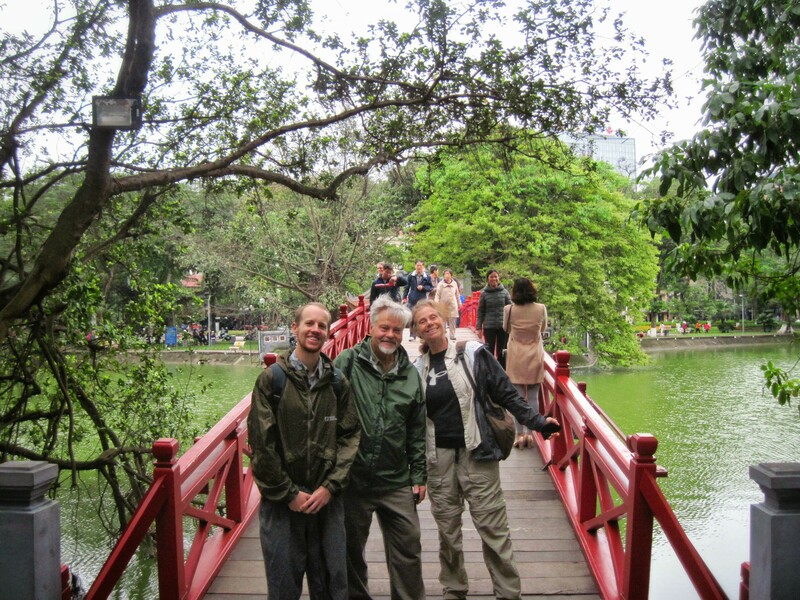 However, when we got to Hanoi, we finally got the weather we needed. Normally we are not thrilled with cloudy, dreary weather. But we got it every single day in Hanoi and we loved every second of it! This was us in Hanoi. Cool, cloudy weather, yay! It had been ages since we had been to a real Zumba class! We visited one in Dallas when we were home for the holidays, but not since then. We’d had a chance to experience a few other aerobics classes in Phnom Penh, Sukhothai, and Bangkok, but we were itching for another real Zumba class experience. 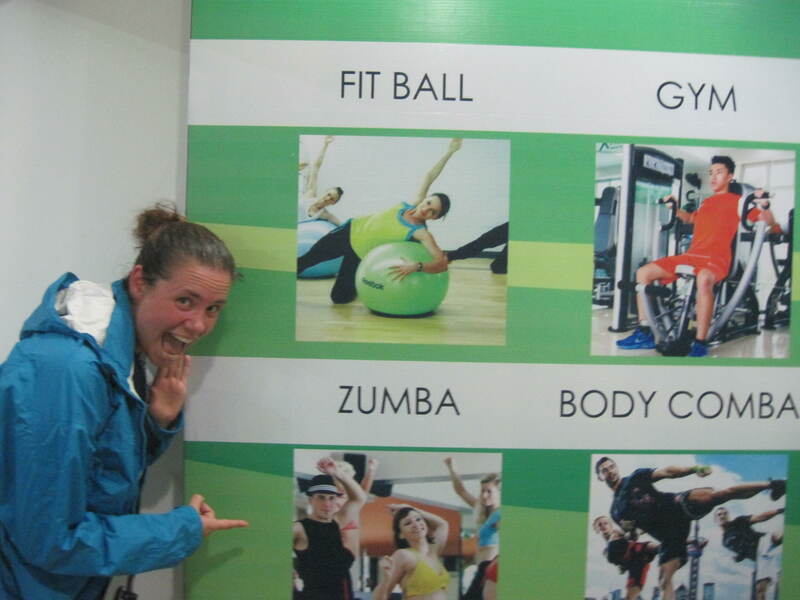 When we arrived in Hanoi and searched the Zumba website, we knew we might be in luck. However, the class we actually went to was found just as we were walking around the city. There was a gym called XFitness only a few blocks from our hotel and it had a sign for Zumba in the window! We found out that we could buy a day pass for 110,000 dong (around $5.00), which is quite expensive for Vietnam standards but not too bad for a Zumba class by US standards. The gym was fancy with luxurious locker rooms and even a sauna, so we decided to come for a 6:20 class on the following day. We were quite exhausted after a long day on our feet sightseeing in Hanoi so were feeling a little lazy about getting to the class. But, like most things, we knew we would be glad once we were there, so we pushed ourselves out the door, through the rainy weather, up the elevator to the 7th floor for XFitness, and into the class. The class was excellent! It was very high energy and included a lot of reggaeton and popular music. There were actually two instructors. We never really could figure out who was the main instructor and who was learning… or maybe this class just normally has 2! They were both young women with great moves and a lot of energy. We both had to work hard to keep up with the class, but Eric was pleased that he was not the only guy there! We think we were a bit of a novelty in the class, which is strange because Hanoi seemed to be a very cosmopolitan city. But most people seemed quite surprised to see us there and weren’t sure what to make of it. Overall, we had a great time and were quite excited to finally get into another Zumba class! In the past we’ve tried to use our frequent flyer points for as many flights as possible, but within Asia we have actually struggled to find ways to fly for free. The points we have just didn’t help for flying to the places that we would have liked to go. But recently we’ve been able to figure a few out! This one was a last-minute decision. 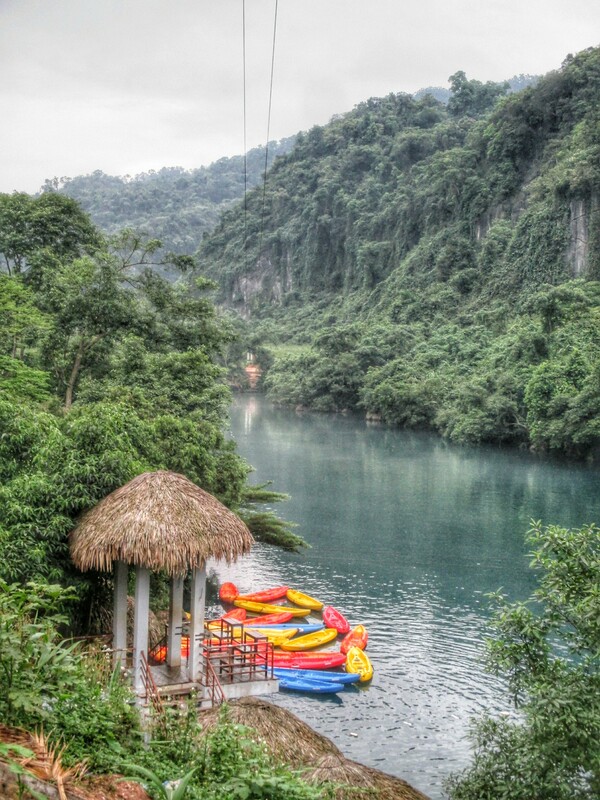 To get from the caves of Phong Nha to Hanoi in northern Vietnam was not as easy as we had originally anticipated. We thought that there would be multiple transport options, but as it turned out, the only bus from the village was a night bus, and the train (from the closest city of Dong Hoi) would take 11 hours and either involve an overnight stretch or take an entire day. All sounded like grueling options. We were really struggling to choose the best of these limited options, and then we thought outside of the box. Using the wikipedia page for Hanoi’s airport (a top tip for figuring out what you can do), we saw that there was a direct flight on Vietnam Airlines from Dong Hoi to Hanoi. We ran an award flight search on Air France, and saw that we could use their Flying Blue miles to fly on this flight (since Air France and Vietnam Airlines are partners) – for $3.29 in fees plus 10,000 Flying Blue miles per person. Even with a private transfer to Dong Hoi airport, this worked out as cheaper than the train (which we had been leaning towards) and got us there significantly earlier. To get the Air France Flying Blue miles, we were able to transfer our existing points from American Express Membership Rewards that we had gotten as a signup bonus for a couple of different American Express cards. With Vietnam Airlines being a Sky Team alliance partner with Air France, our flights within and from Vietnam were prime targets to use the Flying Blue miles on. 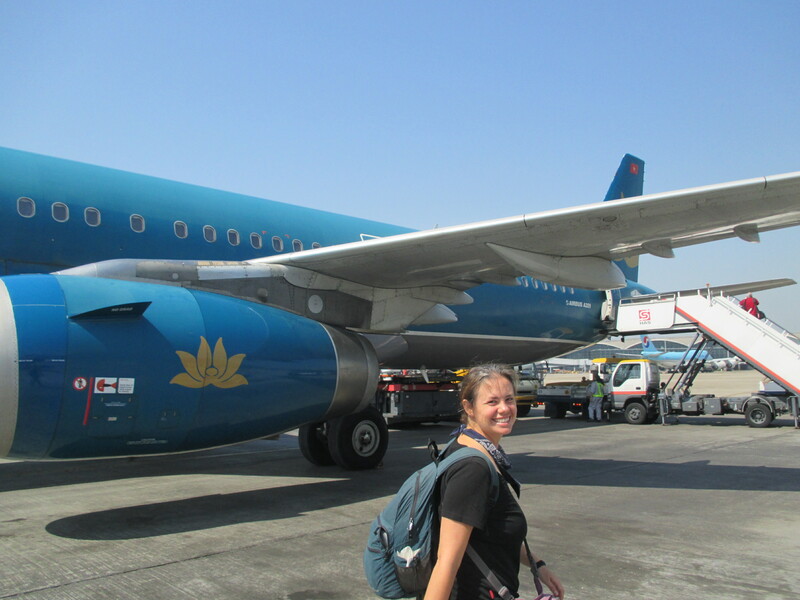 We were also able to snag a ticket to Hong Kong on a Vietnam Airlines flight using the Flying Blue miles as well. We got the necessary 10,000 Flying Blue miles each by transferring some more of our American Express Membership Rewards points. The fees were $31.90 per person. Hong Kong’s airport is the hub for two major airlines that are a part of the oneworld alliance, so we figured that using points for one of those alliance partners would work well for our flights to or from there. 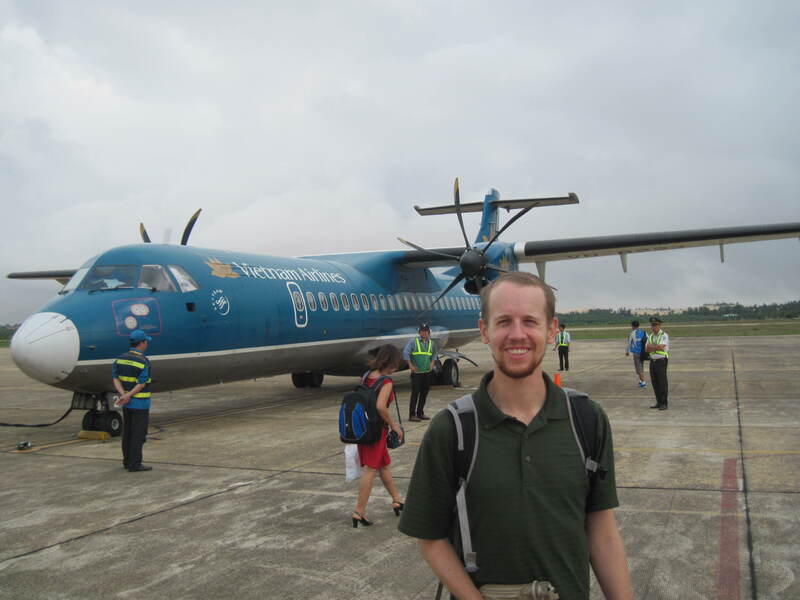 We were able to use this to our advantage to get a flight from Hong Kong to Kathmandu in Nepal. We found a reward flight on the Hong Kong-based airline Dragonair that we were able to book using our British Airways Avios points. We were able to get the required number of Avios by combining some Avios we had left over from signing up for the British Airways credit card with even more of our American Express Membership Rewards points that we could transfer in. The final cost was 10,000 Avios and $39.47 in fees per person. These three examples just go to show how flexible you have to be when booking an award flight. Knowing which airlines partner with other airlines through alliances is huge – we greatly benefited from Vietnam Airlines being in an alliance with Air France and Dragonair with British Airways. Here’s a good infographic explaining the different alliances. Having points in a program that can be transferred to multiple partners is also a great benefit. We didn’t have to earn Air France miles or British Airways Avios directly; instead, we could just use our American Express points for both. For more information on transferable points, check out this resource. We have a few more award flights lined up that we are excited to share with you soon! We had read a couple articles informing us that not so long ago, people had discovered one of the biggest caves in the world in Phong Nha National Park in Vietnam. While we knew we weren’t going to be able to afford the $3000 fee to explore that cave, it did start us looking into the region. We discovered that it was a beautiful place full of large and interesting caves. We’ve had quite a few fun adventures in caves, so we were sold! We left Wayne and Peggy in Hue with plans to meet them again in Hanoi. 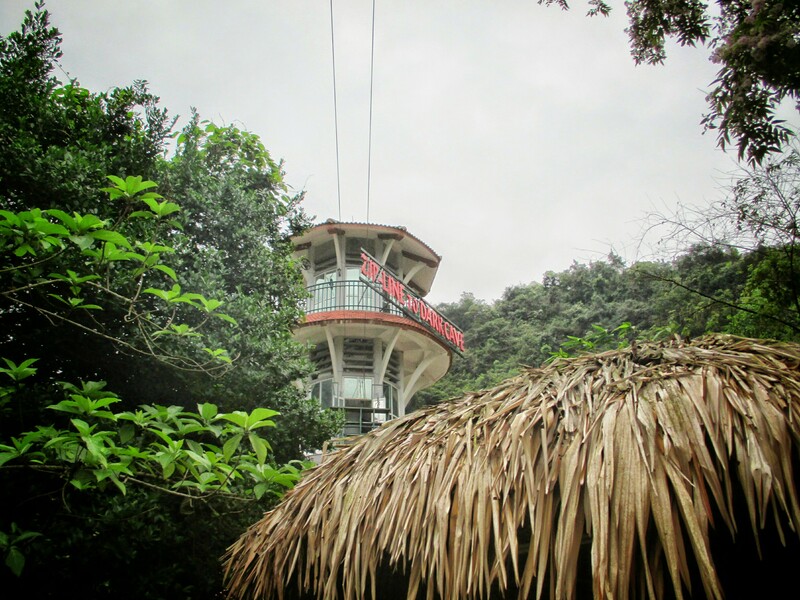 Many people just do day trips to the caves, but we thought it was a bit too far for a comfortable day trip, plus we thought the area had enough to do to warrant an overnight stay. We purchased a tourist minibus straight from Hue to the town near Phong Nha. The minibus was just fine, quite comfortable. It wasn’t even full, which feels like a rarity. We stopped for our bathroom break at an interesting place that we had never heard of. It was a local Catholic church called Our Lady of La Vang that has a neat origin story involving the Virgin Mary appearing to settlers in that region. It was heavily damaged – we assumed from the war with America. However, they had rebuilt a new building for the church attached to the old steeple. In addition, there is a huge statue of Mary nearby. It also appeared that you could purchase large bottles of holy water to take away with you. We didn’t, but a Vietnamese family on our bus did! We stayed at the main hostel in town, the Easy Tiger. It was fine, but was a large hostel with only dorm rooms. We never enjoy staying in dorm rooms – although as far as dorms go, these weren’t too bad: comfortable beds with only 4 to a room. We had been hoping to stay at a place that we had read about called the Phong Nha Farmstay which was a lovely guesthouse out in the country, but unfortunately they were full. The book also made it sound like the town was super small with not a lot of services, so we jumped on booking the Easy Tiger as soon as we could. When we arrived though, we saw that the town was actually booming and there would have been plenty of other places to stay. Probably where we could have gotten a private room for even cheaper than what we paid for the dorm. So, next time we’ll know! The Easy Tiger did have free breakfast and a large common area/restaurant which was nice. This did cause us to end up being more social and meeting more other travelers than we had done in a while! The Easy Tiger also provided some of the more interesting tours of the region. There were lots offered and we spent a significant part of our first day making decisions relating to the tours (and how we were actually going to leave Phong Nha and get to Hanoi… but that is a different story!) 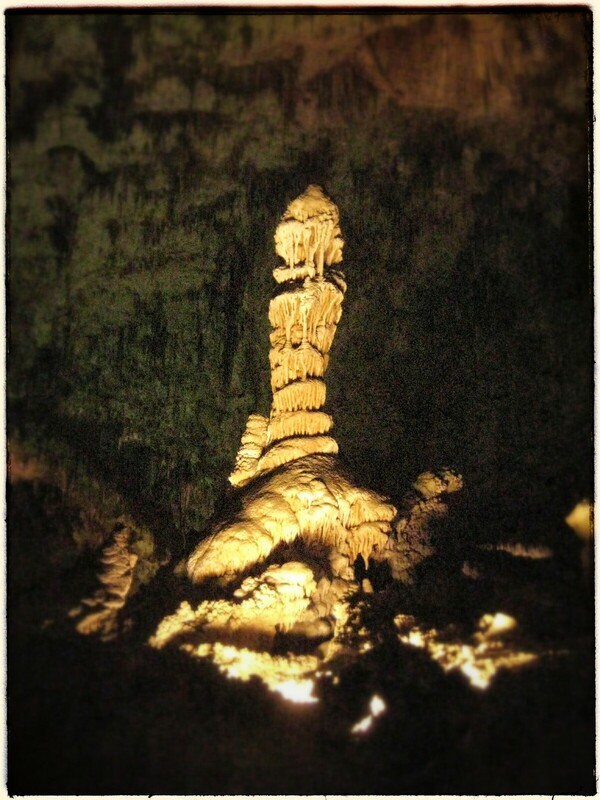 After agonizing for what seemed like hours, we picked the cheapest tour which also took us to the most amount of caves. We started the tour at 8:45 the following morning. We were picked up by minibus and whisked off into the national park. The park is absolutely gorgeous. The mountains are covered in brilliant green jungle. We were also excited because for the first time in ages, it wasn’t glaringly hot. Still humid, but a much more comfortable temperature. We enjoyed some of the stops along the way where our guides explained more about the formation of the park (large limestone karsts) and more about what happened in this area during the American War. It was heavily bombed as the Ho Chi Minh Trail ran through. For those who don’t know, the Ho Chi Minh trail was a path that the North Vietnamese used to supply their fighters in the South during the war. The trail was over 2000 km long and made its way through Laos and Cambodia before arriving in South Vietnam. The US bombed the trail constantly so it was a huge amount of work for the North Vietnamese Army and volunteers to continually rebuild it. We learned that many of the volunteers working on this section of road were young – in their 20s – and many of them died doing this work. Our first main stop was called the 8 Lady Cave. It currently houses a temple to remember 8 youths who died here. They climbed into the cave for shelter during US bombing, but then the entrance caved in. Apparently they lived in the cave for 9 days before they died. This is actually unrelated- but it was at this temple that we saw probably the biggest spider we’d ever seen. He was the size of our hands! Our next stop was significantly less solemn. We headed to Paradise Cave which used to have the title of the longest cave in Asia. There is currently 1 km open to the general public. The cave was lovely with large formations – both stalactites and stalagmites. Perhaps the most distinctive thing we saw though was some sort of Asian music star filming a music video in the cave! Music star making a video! After we “geared up” we headed to a zipline! Della was a little unsure given the quality of the other gear, but the zipline seemed to be in much better condition than the life vests. We took a long zip across the river with no problems. Once on the other side, we slipped into the water for a quick swim to the cave entrance. We flipped on our headlamps and entered the Dark Cave. The walk was a bit difficult as we were in bare feet having to climb over sharp limestone formations. However, after a short time it got a bit better as we started to walk in mud. Then the mud got deeper, over our feet, up to our ankles, up to our knees! Before we knew it we were walking in mud waist deep! After a final climb over a rock and slip and slide, we were actually swimming in the mud! Now this was something we had never experienced before. It was heavy, making it a bit harder to move than you’re used to. But at the same time, it made you feel incredibly light because you could literally float on top of it as soon as you picked up your feet. Once the whole group was in the mud pool, our guide instructed us to turn off our lights. It’s hard to describe exactly what this felt like. In the pitch black, with the mud messing with our sense of gravity, we imagine it felt like we were floating in outer space. It was truly a unique and wonderful experience… too bad we have no pictures of it to share! You’ll just have to go and do it for yourself. After our mud swim, we came back into the main section of the cave and rinsed ourselves in the stream running through. We then took an enjoyable swim through the cave in the dark. Finally, we headed back out where we jumped on to kayaks to bring us back across the river. But our day was not done! We all had one last chance to do a quick zip line out to drop into the river. It was an exhilarating way to end an excellent day. Oops- we didn’t take the picture till Della was pretty much finished! We only stayed in Phong Nha for 2 nights, but it is a place that deserves a lot longer than that. The area is absolutely stunning and we wish we could have spent more time exploring it. The cave tour we did was pricy, but great. There are also several other cave tours offered that we wish we could have tried. Perhaps we’ll have to come back here in the future! After the hustle and bustle of Ho Chi Minh City and the touristy but lovely lanterns of Hoi An, we headed to the ancient city of Hue (actually pronounced like “Hway”- which does indeed negate our title rhyme). This was another UNESCO site that we had been itching to visit. The city is located on the Perfume River and was the capital of Vietnam under the Nguyen emperors from 1802 to 1885. We had read that the coast from Hoi An up to Hue was one of the prettiest trains rides in all of Vietnam. We couldn’t pass that up and booked the trip. It was indeed lovely! We were expecting a 4 hour ride but arrived in only 2 (we must have misread some information) so we were quite surprised when we pulled into the station. A quick taxi ride and we were at our hotel. We stayed at the Sunny Hotel. We quite enjoyed this hotel – it had really friendly and helpful staff and a wonderful view from our room. However, the view came because we were on the 5th floor… and there was no lift! Definitely got a bit of exercise during our stay. The room was comfortable but there was a small downside. We discovered little parades of ants wandering our wall and had a visit from a cockroach our first evening. However, once that was resolved, we were quite comfortable. We also enjoyed the location which was on a small alley/street with many options for eating. We only had two full days in Hue, so did our best to make the most of them… despite the sweltering unseasonable heat. We arrived early our first day, so Peggy and Wayne went out to explore the river and a pagoda. However, Della was feeling quite sick having caught a bad chest cold. She decided to relax in the room for the afternoon and Eric opted to join her, hoping to catch up a bit with the blog. The next day, however, we set out for a full sightseeing experience. We headed to the Imperial Citadel which was a short walk from our hotel. We enjoyed the foot crossing of the bridge over the large Perfume River on our way. We then headed over the moat and first through the 6m high walls of the Citadel. Within the Citadel is another set of walls and the impressive Ngo Mon Gateway into the Imperial Enclosure, where all of the main activities took place. From there we explored the large site which had been largely destroyed during the French and American wars. However, there is a lot of ongoing restoration work. We explored the Thai Hoa Palace which was used for official receptions and important ceremonies before heading to the Hall of the Mandarins. “Mandarins” were any government official. We found it interesting to read that they were chosen by testing alone. They would go through schooling and official tests were set up every few years. As the mandarins passed each test, they would move to a higher level. The final test was given by the emperor himself and would determine whether a mandarin would work or not. The Emperor’s Reading Room was small, but very lovely. We enjoyed the formal Royal Theater, where we were able to escape from the scorching sun for a few minutes. The Co Ha Gardens were lovely to stroll through. The Forbidden Purple City was once reserved for the personal use and residence of the emperor, but there is not much left now. Some of the the most beautiful parts of the entire enclosure were the Truong San Residence and the Dien Tho Residence for the wives and mothers of the emperor. It was here where we found a small coffee shop to relax and escape the heat for awhile. Our final stop was the Thai To Miew Temple Complex which houses shrines to each of the emperors. We enjoyed learning a little bit about the personalities of each emperor. We were especially amused as one was described as working late into the night because he “was slow.” We interpreted that one way, but found out the next day that it really meant something more like cautious and deliberate with his work. By this point, the heat had sapped almost all of our energy. Della especially, but also Wayne and Peggy, were still recovering from illness so we headed back to the hotel for a much needed siesta. 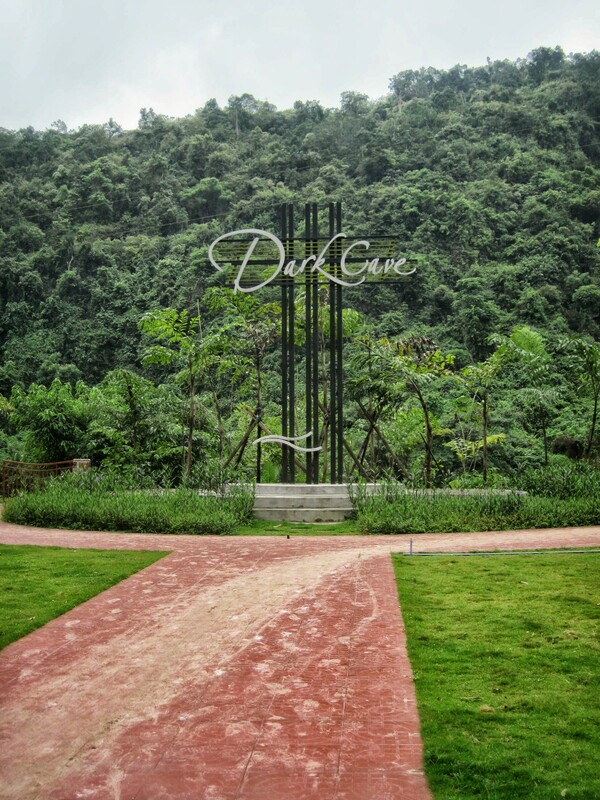 The next day, we rented bikes and headed outside the city of Hue. There are many extravagant tombs of Nguyen emperors dotting the countryside nearby. We decided, again because of the heat, to head to the closest tomb, the Tomb of Tu Duc, which was about 6 km outside of the city. We debated the idea of hiring a car to take us to more of the tombs (in air-conditioned comfort) but decided against as each tomb had a steep entrance fee and we weren’t sure we needed to see more than one. The bike ride was slightly nerve-racking at first as we navigated our way through the busy, motorbike filled roads. But, we made it safely and breathed a huge sigh of relief as we passed into the countryside and once again found ourselves making our way through lovely, green rice paddies. Emperor Tu Duc was the emperor we mentioned above as being “slow.” But learning more about him through visiting his tomb led us to change our interpretation of the term from the day before. He designed his tomb himself, for use before and after his death. He apparently lived a life of excess and spent lavishly. The construction of the tomb actually caused a coup plot, but it ultimately did not succeed. Near his planned tomb was the Stele Pavilion which houses a 20-ton stone drafted by the emperor himself. Apparently, on it, he freely admits his mistakes and is quite reflective about his life. Apparently, despite everything that went into building the tomb, Tu Duc is not actually buried there. His real burial site is unknown; he and his wife ended up only using the site while they were living. There is a lake which holds a small island where Tu Duc did some of his hunting, a temple where the emperor and empress worshiped, a pavilion where Tu Duc wrote poetry and entertained his concubines, and even a theater. All of the buildings are mostly restored and quite lovely. Again, drained by the heat, and not looking forward to the heart-pounding ride back to town, we took a different way back. This was slightly longer, but kept us farther away from the big city streets for longer and allowed us a meander along the river. This was a good choice and we enjoyed a quick snack in a park before arriving back to the hotel. 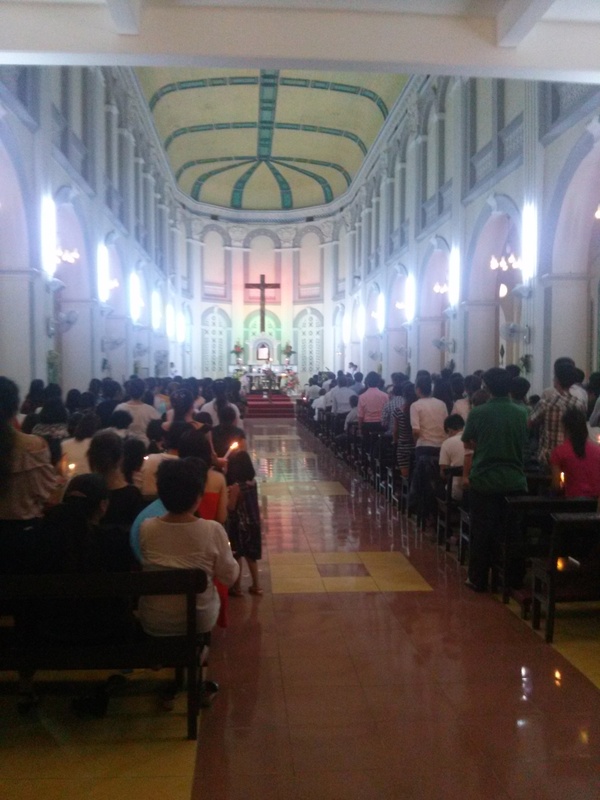 We also celebrated Easter in Hue. By celebrated, we mean that Della and Eric slept in a bit and Wayne and Peggy attempted to visit a church. However, the posted times of the services seemed to be wrong and they were only able to catch the last 10 minutes of the service. The food in Hue is fit for a king! Or, rather, the traditional foods of Hue were some of the emperor’s Tu Duc’s favorites. We also enjoyed them. The first we tried were a kind of rice pancake, called Banh Khoai. They would serve it with rice paper wrappers and you would roll the pancake in with bean sprouts and other greenery. We also tried a smaller version which was a tiny bite sized pancake with a morsel of flavor called Banh Beo. Eric also made sure to try a soup we had first had in Saigon called Bun Bo Hue. Two of our more memorable meals ended up with us taking away something that wasn’t food! We ate at a restaurant called Lac Thien after our day exploring the Imperial Citadel. We enjoyed both Banh Khoai and Banh Beo and beer, of course, because it was so hot. The staff was very sweet and particularly enjoyed showing us how to open our beer with a different kind of opener. We actually were familiar with them as they were used widely in Myanmar, but it was a lot of fun to see them again. The owner is deaf so we weren’t able to chat exactly, but he communicated so much energy, kindness, and delight it was lovely. He also signed one of the beer openers and gave it us to keep! The second restaurant was lunch after our long, hot bike ride to the Tomb of Tu Duc. We ate at the Mandarin Restaurant which was quite good. Here, the owner is a photographer, so we were surrounded by lovely images of Vietnam while we ate. When we left, the staff gifted us with two postcards with the owners photographs! Our final dinner was eaten on the waterfront of the Perfume River. The whole area becomes quite lively after dark with street musicians and a large food market. We expected the restaurants there to be expensive, but we found one with quite reasonable prices. We enjoyed the cool breeze and the lovely lighting of the bridges over the river. We really enjoyed our time in Hue. We found that it didn’t really feel as touristy as we were expecting. The evening on the river front was enjoyed mostly by locals, almost no foreigners at all. Through discussions with travelers after we left, we found that most tourists make Hue a day trip either on their way to or away from Hoi An. We were so glad that we stayed a few days and got to experience more that the city had to offer. The tourist sites were beautiful, marred only by the outrageous heat. Hue is worth a bit of time! Hoi An, our second stop in Vietnam was a large contrast from our first stop of Saigon: instead of wide lanes clogged with motorbikes and fronted by modern buildings, there were narrow streets that were pedestrian only and featured quaint old buildings that looked like they haven’t changed in hundreds of years. We spent three days exploring the atmospheric streets of Hoi An and the scenic sites of the surrounding region. For most ways of travel, to get to Hoi An, one first has to get to the major town of Danang, where there is an airport and train station. We debated between taking a cheap flight that would arrive late or taking an overnight train, and in the end chose the train partially for a slight cost savings and partially just for the novelty of an overnight train. Based on the advice from the very helpful Seat 61 blog, we hoped to book beds in the “soft sleeper” class, which have 4 bunks to a cabin. But, by the time we tried to book, all of these were taken, so we had to settle for bunks in the “hard sleeper” class, which have 6 bunks to a cabin. We had to take the middle bunk, which wasn’t ideal. Our train pulled out of the station promptly at 7:30, and we headed north. Our bunks were not as spacious as we would have hoped; there wasn’t enough room to sit completely up, so we just had to lay down. Our cabin was full, with two older gentlemen in the bottom bunks and a young married couple in the top bunks. Unfortunately none of them spoke English so we couldn’t really discuss the logistics of moving around and going to bed in the tight space. They went to bed fairly early, but we had reading lights so we could read for a while longer. We got some fitful sleep, but then were woken up early when the gentlemen in the lower bunks decided to have a full strength conversation at 5:30 in the morning. We arrived in Danang on time at 12:30. Della’s parents had arranged their travels from Siem Reap (Cambodia) so that they were also in Danang and we could continue our trip through Vietnam with them. We caught a cab to the hotel where they were waiting. They had arranged for a private van to transport us the 30 minutes to Hoi An. They also set it up so that the driver stopped for us to sightsee at the Marble Mountains, a tourist attraction in between. We went up the most popular of the mountains, and visited a few of the Buddhist pagodas and caves found on top. We stayed at a recently opened guesthouse called the Viet House Homestay just outside of the Old Town. The family that ran the place was very nice and made sure that we were enjoying our stay. The rooms were nice and large, and the included breakfast was cooked to order. We also enjoyed the location, as it was within walking distance of Old Town but also on a more local street with some very affordable restaurants. Our room was quite spacious! Explore Old Town – The town of Hoi An was once a major center of trade, and now definitely shows the influence of the different cultures that were the trading partners: China and Japan. There are also many French influences. It is scenic just to walk through the streets and admire the sights, but to really get a feel for the history you need to purchase a ticket to go into some of the historic structures. Each Old City ticket gives you five vouchers to visit a choice of more than 20 buildings, so we made sure to structure our visit to see the five that seemed most interesting. Our first stop was the Handicraft Workshop, where we made sure to arrive in time to catch the first showing of the twice-daily arts performance. This was a nice overview of different Vietnamese arts, including music, dance , opera, and a special bingo game in which the winning combinations are sung out. We also went to two assembly houses. These structures were built by groups of Chinese immigrants from the same part of the country to be used as a place to gather for social events and a place to pray to their gods. We visited two: the Assembly Halls of the Chaozhou Chinese Congregation and the Fujian Chinese Congregation. The former was smaller, but with nice wood carvings and a party going on as were were visiting. The latter was pretty elaborate and fronted with a nice pink gate. Hoi An also has many private residences which can be visited for one of the vouchers on the Old City ticket. We first went to a small one, the Quan Thang house. We didn’t see the fancy carvings that the guidebook promised, but we did enjoy chatting with the proprietor and having the place to ourselves. Our final stop was the Lonely Planet top choice, so we knew we wouldn’t be the only ones inside. It was quite pretty inside, and we were able to eavesdrop on a tour and get a little bit more information about what we were seeing. It wasn’t a part of our ticket, but we definitely wanted to make sure and visit the iconic Japanese Covered Bridge, built in the 1590s to link the Japanese side of town with the Chinese. We went on our first night, and then returned after sightseeing one afternoon to make sure we got good pictures. Can you spot Della and Peggy? Our plans to do a guided bicycle tour fell through, but after consulting a map we decided we could just rent bikes and head to some of the sights ourselves. The Viet House provided two bikes for free, and then our host suggested a place across the street with cheap options to rent more. We followed a vague plan that was a scenic route towards the beach. As we got away from the city, we saw large rice paddies and shrimp farming. Everything was an impressive shade of green. Our maps program led us down what turned out just to be a tiny path through shrimp fields, but we made it though just fine. At An Bang Beach, we found a place that had chairs under an umbrella, called the Banyan. In hindsight, there were plenty of places down the beach that were probably cheaper, but the Banyan was a comfortable, convenient place for us to base ourselves for an afternoon of relaxation. The water wasn’t as warm as in Thailand but was still refreshing. Day Trip to My Son – Before the Vietnamese people moved south into the area, the dominant power was the kingdom of Champa. At the site of My Son, there are the remains of a large number of temples built by the Cham people. The temples are primarily dedicated to the Hindu god Shiva, and there are many examples of linga and yoni that are shrines to him. The Cham built their temples using bricks with no mortar in between, and we found it impressive how well the structures and carvings had held up. Parts of the site, though, were seriously damaged during the war when the US bombed the area to try and destroy the Viet Cong forces using it as a headquarters. We were glad to be able to add another UNESCO World Heritage site to our list, but the heat and humidity in the jungle setting was so oppressive that they detracted from the experience a bit. We booked a cheap tour through a travel agent we found in Hoi An. Our transport to the site was a 30 minute minivan ride, but for the way back we “splurged” and paid a little bit extra to return by boat. This was a little misleading, as we drove back about two-thirds of the way before getting on a boat for the final stretch. The boat did make an extra stop at an island that is a center of woodcarving. This would have been more impressive if we hadn’t already seen the process in every other Southeast Asian country we have visited. Lantern Festival – On the night of every full moon (well, really the 14th day of every lunar month), the old town of Hoi An throws a Lantern Festival. The streets are lit just by lanterns (most normal lights are turned off), businesses put out shrines for their ancestors, and on a few corners there are special music and theatrical performances. The most impressive part is the launching of lit candle boats onto the river for good luck. You can actually do this every night, but on the night of the Lantern Festival it is ramped up and the river is filled with the illuminated rafts. We felt a little guilty contributing to the pollution but still decided to do it once. Honestly, we were a little underwhelmed by the festival itself. The atmosphere wasn’t that much different in the Old Town than on the other nights, and the hassle of the crowds was harder to deal with. Hoi An specializes in a few good dishes that aren’t found anywhere else in the country, notably cau lau, a dish made with a unique type of noodles and served with roasted pork, and “white rose,” a small shrimp dumpling. We made sure to sample these at multiple restaurants in the area. Our first night in town we headed to a slightly fancy place in the Old Town that presented a more refined take on these Hoi An classics. It was a bit pricey though, so the other nights we ate at the cheap restaurants on the same street as the Viet House, including one that was strictly vegetarian so had slightly different versions of the dishes. In Hoi An we also had our first chance to sample “fresh beer,” a classic beverage that is unique to the country. The beer is called fresh because it has just recently been brewed and is served without preservatives. It has less alcohol than normal beer and less carbonation, but is very cheap. We paid 5000 Vietnamese dong (about 25 cents) at one place, and then at the restaurants near us it was only 3000 dong (about 15 cents)! The town of Hoi An is quite charming, with great history and beautiful architecture, and we loved the streets lit up by the colorful lanterns at night. On the other hand, it felt a bit like an amusement park version of Vietnam, with more tourists on the streets than locals and quite a few vendors wherever you turned. Our favorite day was probably when we took our bikes out to the beach and got to see more of the everyday life of people in the area.